Let's give a big THANK YOU to Doodle Pantry for sponsoring our blog for the month of May. I love the biscotti and wonderful coffee mug. I don't drink coffee and now I'm tempted because this looks so GOOD! A BIG Thank you to Marsha. Cathie is showing us her sweet side today. 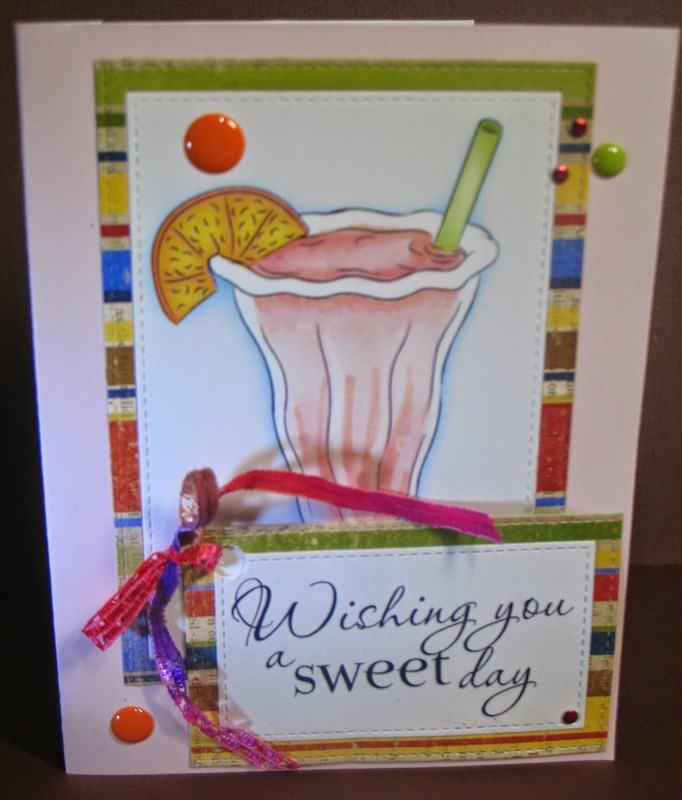 Of course, she's always sweet, but she's triple-sweet today with a triple threat sweet card. I love the colors and design. Doodle Pantry Yummy Cupcakes for image and sentiment. MPress Curved Rectangle, Poppy Crafts Curved Rectangle. 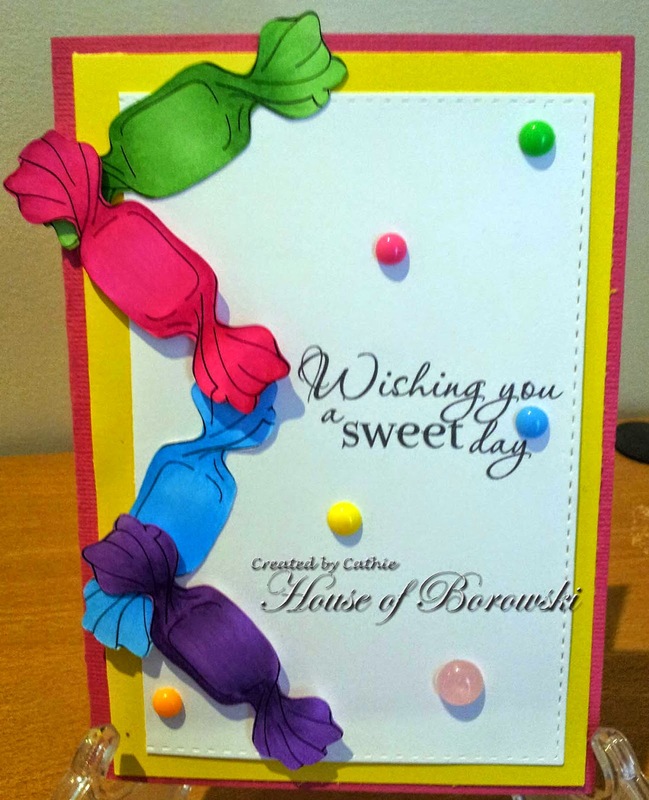 Michelle's card is SWEET AS pie. 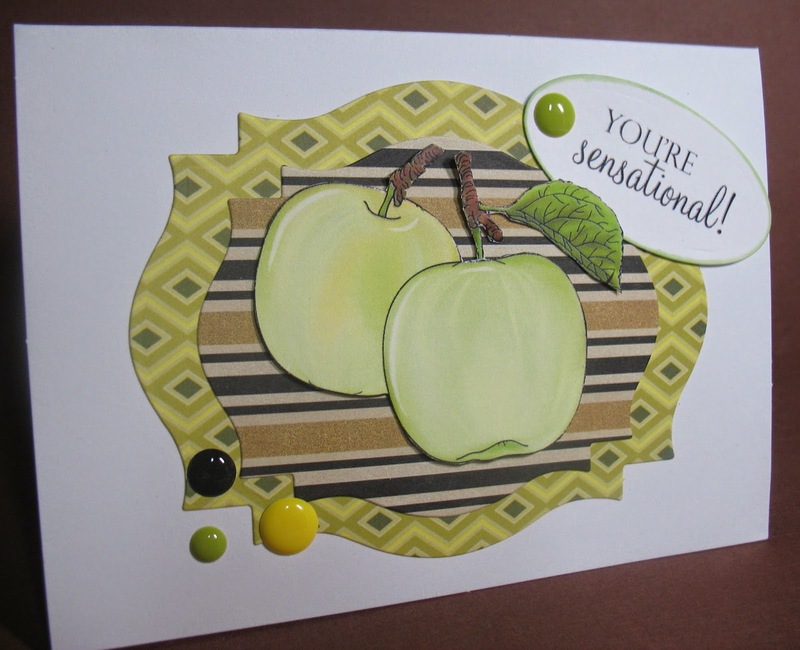 What a wonderful design she's used, Doodle Pantry's very own card cut. What a wonderful way to show thanks by baking a wonderful Cherry Pie! 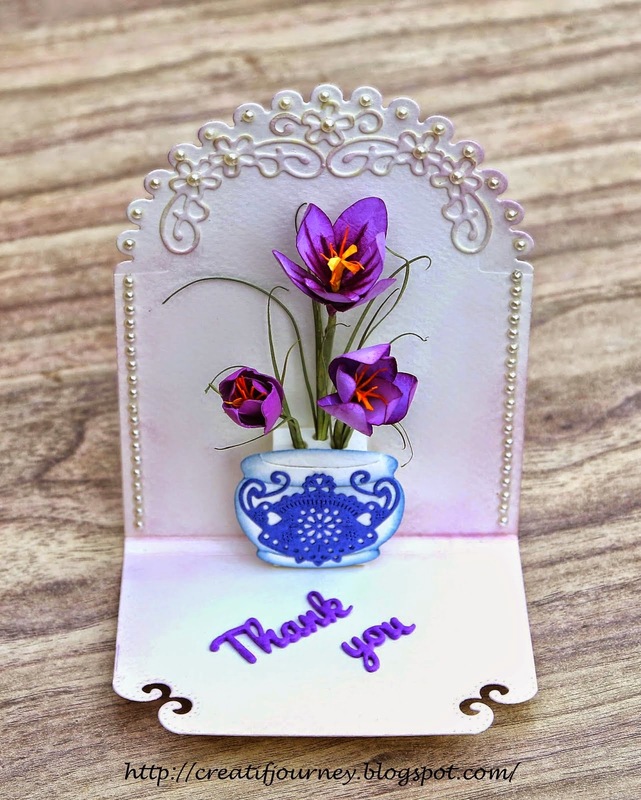 Visit Michelle at her blog Just ANutter Paper Crafter. 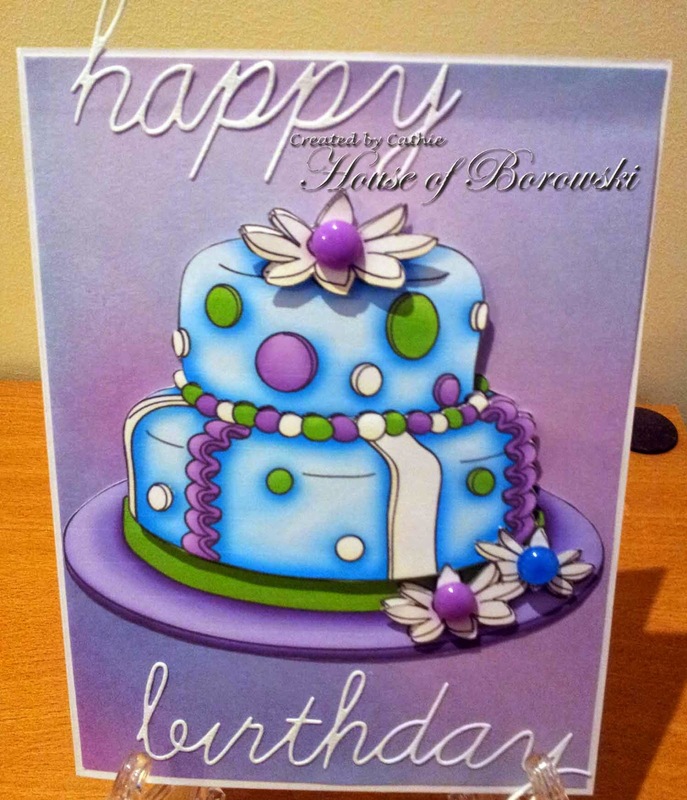 Arlene's card below. She loved the apples and cut them out for your viewing pleasure. I hope you enjoyed this month's challenge. It seems to have been a challenge. 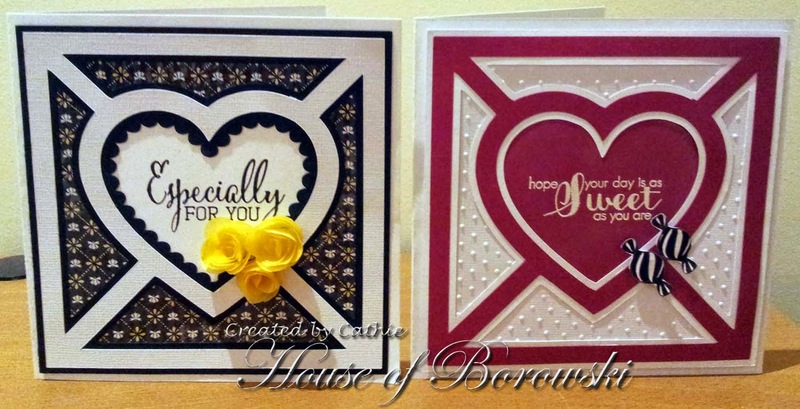 Absolutely gorgeous cards just for you from Cathie. Don't you love the design? The colors and design make the cards stunning, spectacular, amazing, stylish, elegant.... and on and on. Need I say I love them. I'm sure Cathie has more to share with you on her blog. 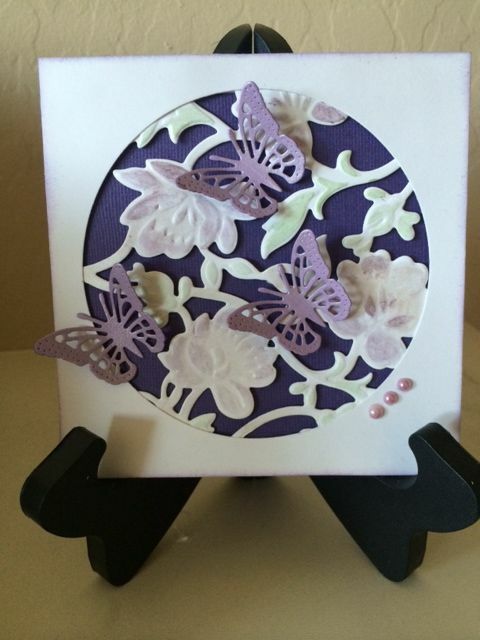 Cuttlebug Swiss Dot Embossing Folder, Quilled Creations Roses. Doodle Pantry, our sponsor for May has so many simply fantastic images to work with. Look what Michelle did with a few violets and a recipe. Let me introduce our new Diva! Monica is from Illinois in the USA. She's the owner of a Cuttlebug and a Cricut. She'll be starting June 1st. when we start our new challenge. Here's Monica's bio below. My husband and I have 3 boys, and I work part time at Michael's. I've lived in IL since 2003 but was born in TX. I grew up a "military brat", so I've been lucky to TX, FL, Germany, IN, NC and IL home at some point in my life. I've been crafting things since I was little. 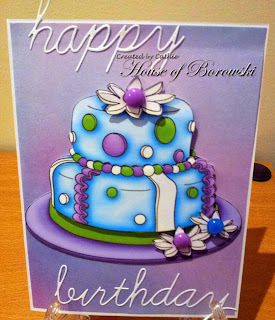 I've dabbled in painting (canvas, wood and plaster houses), sewing, wreath making, crochet, scrapbooking and card making. 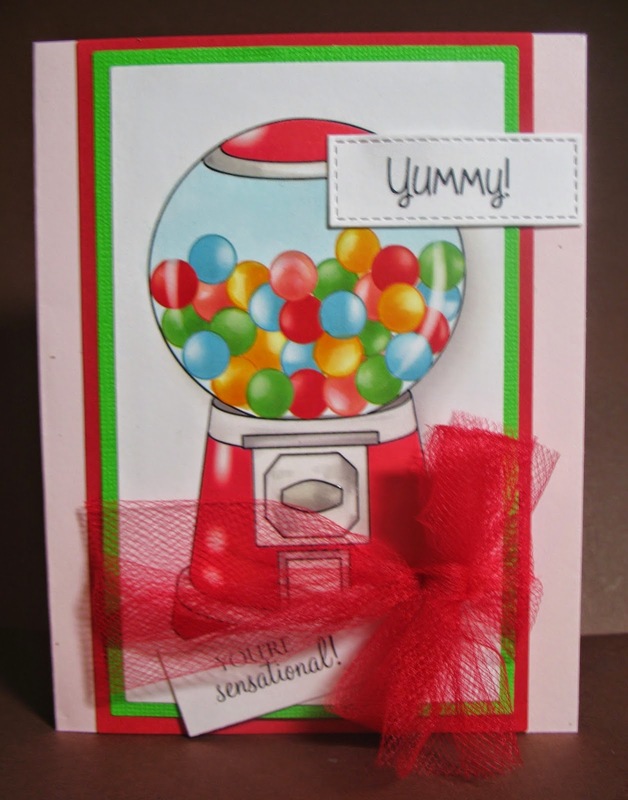 Card making has become a favorite, why buy a card if I have the supplies to make my own! 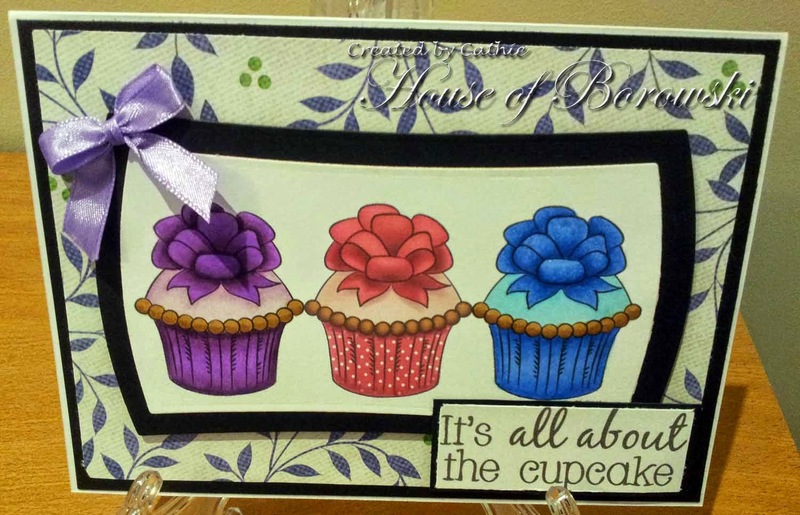 Welcome Monica to the Die Cut Divas. Check out her first Diva card on June 1st. You really Can Have Your Cake and Eat It Too. Fantastic sponsor has it all. Take a look at what Marsha is bringing us today. Marsha's got a sweet tooth and now so do I. I love her color combination and design. Perfect. I can't wait to check out Marsha's personal blog too. Doodle Pantry pre-colored Cake and Cookie image with matching paper. 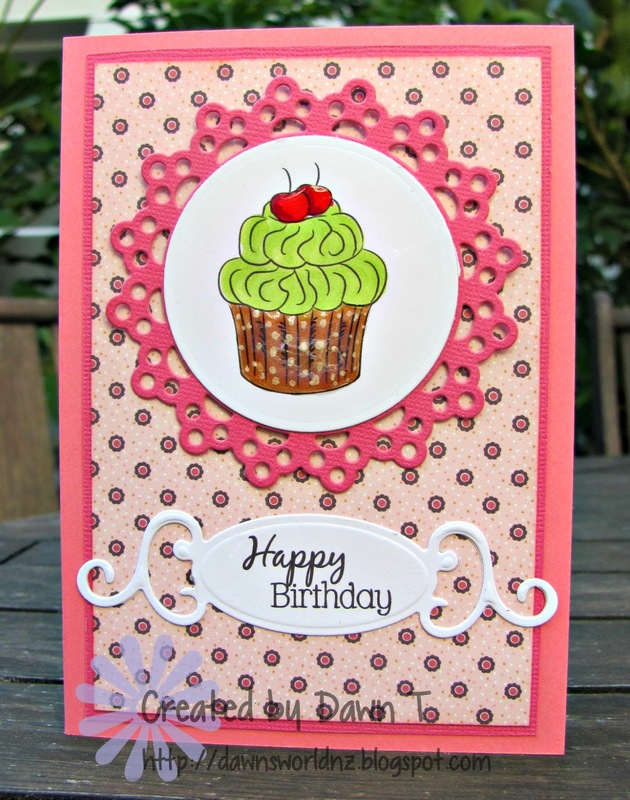 MFT Die-namics Circle Stax, Spellbinder ribbon tag. "You're pretty much aged to perfection"
"You're pretty much aged to perfect"
Michelle makes me think of grapes aging into a beautiful glass of wine. What do you think of Michelle's sentiment? I love it. Such wonderful background colors make me love this card. Doodle Pantry has so many different digitals and the sets are fantastic as you can see below. Marsha has some BIG Wishes going to someone and she does it in a BIG WAY. 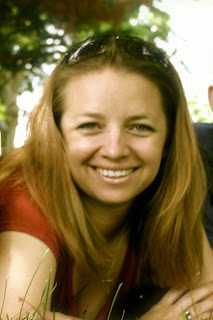 I'm looking forward to checking out Marsha's blog on the big day!.That cake looks so good, good enough to eat! Dawn is coming up with a cupcake for someone special. Just love the frosting color and you can't beat two cherries instead of only one. Yummmmy. Be sure to visit Dawn at Dawn's World. Let there eat cake! Obviously, Marsha and Cathie like cake. I just love seeing how one image can be used different ways with different colors. Remember to stop at Doodle Pantry to check the wonderful sets of digial images. If you like this, you'll love the rest of her images too. Whether our mothers are here or not, it's always great to say a Happy Mother's Day to our motherly friends and celebrate. No matter if it's a dessert or meal, enjoy your friends and have fun. Our DTs have had fun with Doodle Pantry's digital images and want to show the versatility of the images. Arlene just wants a yummy scoop of ice cream in this wonderful thick shake. She will have a sweet day with her granddaughter. Next with some Mother's Day cheer! Dawn surprised us with a pretty cake. 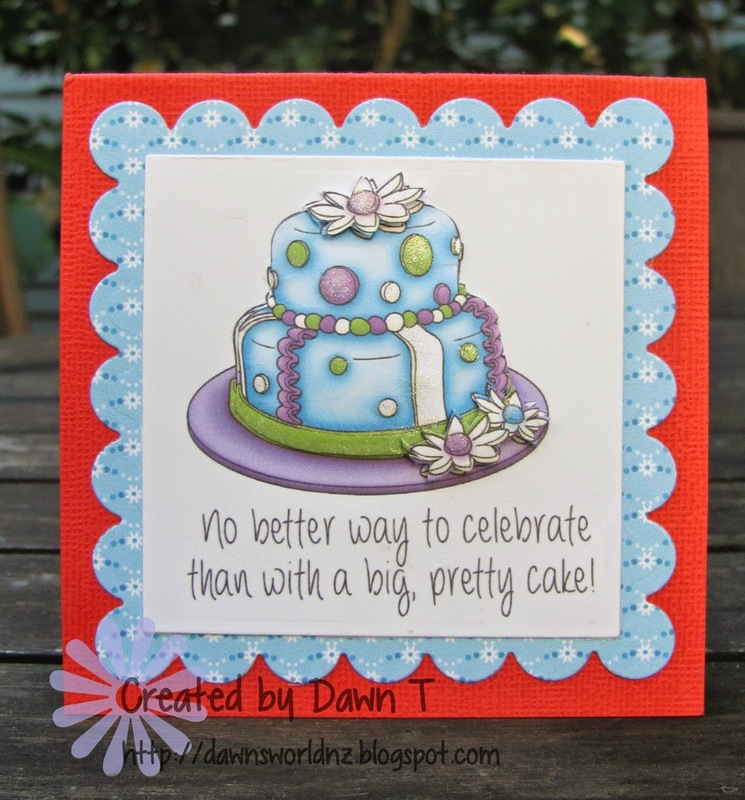 I just love the fun cake and sentiment. It's a perfect cake for Mother's Day, don't you think? Visit Dawn at Dawn's World. Time for a drink to end the day and play. 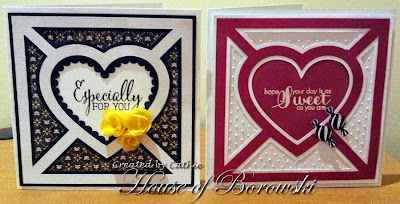 I had such fun putting these cards together. 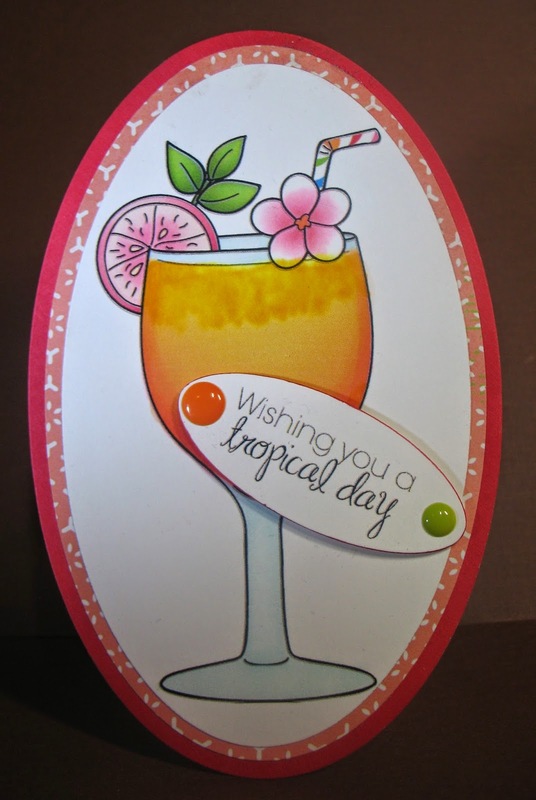 I couldn't believe how many different images were in the Doodle Pantry Tropical Drinks set and how many I would definitely use. Fantastic sentiments to make you smile and have fun. 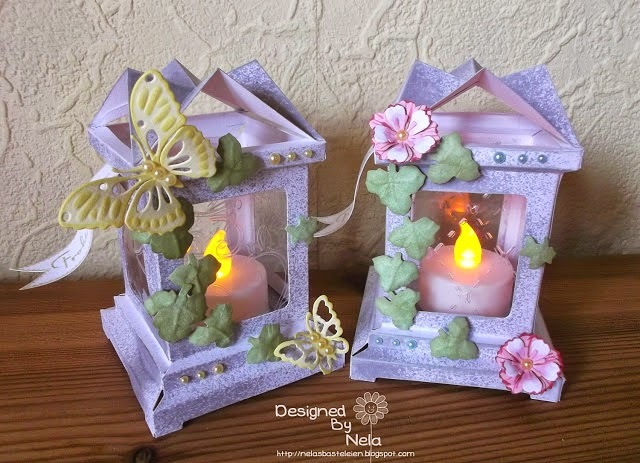 I love the beautiful butterfly and draping flowers from Karen Petitt-reminds me of my Mom's Fushia Garden. 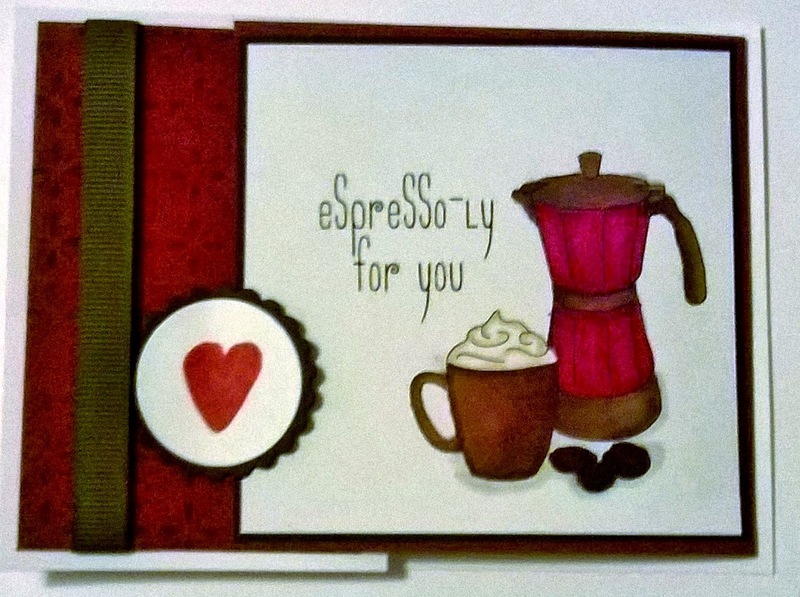 Arlene marveled at this faux laser cut.card from Zelda Cogill and tags it her favorite. Did I hear there's "SOMETHING YUMMY TO EAT"? Doodle Pantry takes pride in creating a diverse selection of doodling styles, like realistic or whimsical, and all of which are family and kid friendly illustrations. We hope you enjoy our wide variety of styles for every family occasion! Their badge is available on request if you don’t already have it, let Doodle Pantry know. Here's a place for badges too. The prize is a $10 gift certificate. We will announce the winner of this May contest on June 2, 2015. Here is DT, Marsha Drain, with one of the cutest pair of pears I've ever seen. I couldn't get over this card when I first saw it on our Designer gallery. I found it so unique and joyful, cheery and fun card that I'd love to send this to all the pairs I know. Do you notice that even the background colors and pattern are just perfect? Yes, they are. Doodle Pantry Pears and Raspberries, Kissy Lips, Mustache Mish Mash. Next up is Arlene, who still puts nickels in the candy machine on her boss's desk. 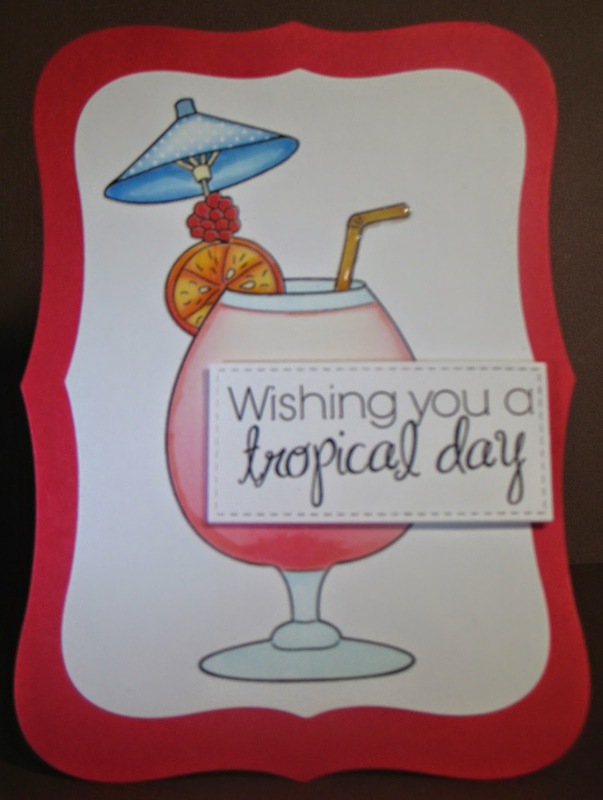 I just loved the colors because you can use just about any color to trim, embellish or otherwise decorate this card. I really think this image would appeal to all ages, young or old, male or female. 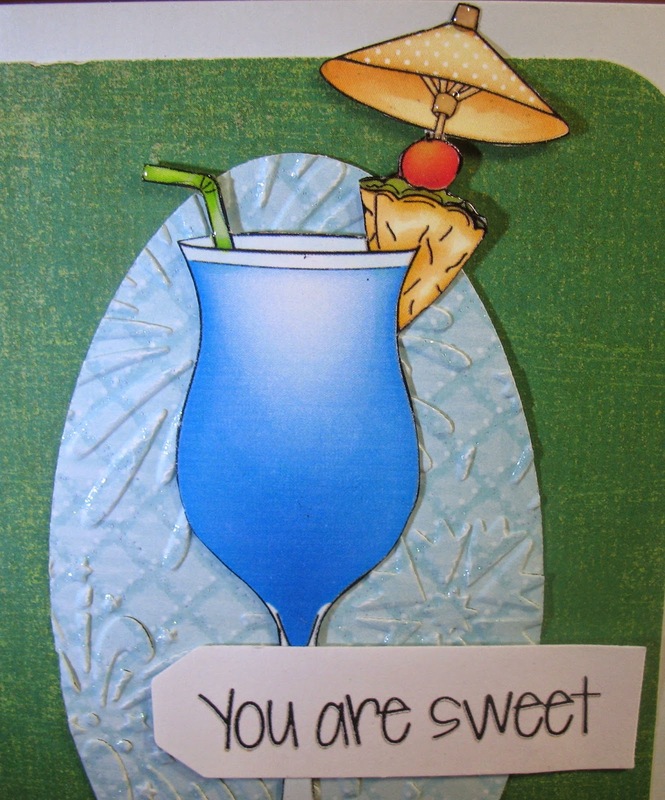 Doodle Pantry Tropical Drinks sentiment "You are sensational"
She has created this card using the digital image of the lollies and the matching sentiment. 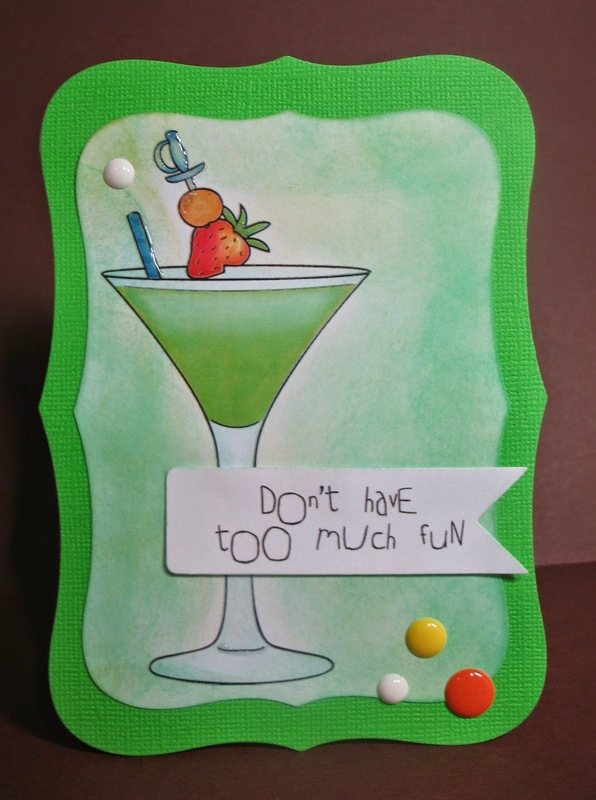 Adding a Simon Says Stamp Stitched Rectangle Die, she created a card for any age.
. Pre-colored images here and uncolored images here. 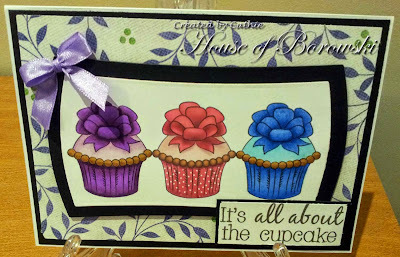 Michelle has a fabulous card coupled with such a great design and color combo, which seems to be just perfect. Hannah, What do we need to wash all this food down? Yes, Something ESPRESSLY FOR YOU! Thanks to Hannah for handling refreshments!